The World's Smartest Ceiling Fan-Heater, especially effective during those cool damp evenings in the mountains of Central America. A small electric space heater typically uses 1500 watts of power. A Room Conditioner will initially use about the same amount of electricity. However, as the room warms up, the Room Conditioner will begin to automatically turn off heating elements, reducing power consumption. Once a room is “seasoned” and at the temperature level set on the thermostat remote control, the Room Conditioner will reduce power consumption to approximately 500 watts of power while at the same time maintaining the same temperature levels throughout the room. Depending on insulation values of the room that is being heated, a small electric heater will effectively heat a very small area, sometimes just the area directly in front of where the heater is, or in the most optimal conditions no more than a hundred or so square feet of area directly in front of the heater. The Room Conditioner will efficiently and effectively heat a 20 foot by 20 foot room with 10 foot ceilings, a 400 sq. feet of area, or a whopping 4000 cubic feet of space. The Room Conditioner does this by taking advantage of heating then moving the room air with its fan blades. As the warm air moves above the heating elements, the air is pushed upwards and across the ceiling, down the walls and rises back up towards the fan back into circulation whereby the process repeats itself. As this warm air is circulated around the room, it warms the room air, windows, furniture and most importantly you.It would be impossible for a small electric room heater to effectively heat such a large area. The Room Conditioner is Kid And Pet Friendly: There is absolutely no need to worry about your loved ones touching a hot heating element. 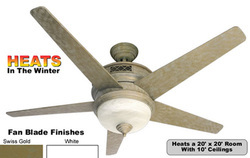 During warmer summer months, the Room Conditioner is also a ceiling fan that operates at a very efficient energy saving rate of about 1 cent per hour (based on an 8 cent per kwh cost.
. 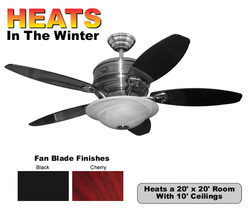 Whisper Quiet ball bearing fan ceiling motor; guaranteed not to hum or buzz. 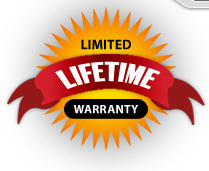 Warranty: Limited lifetime warranty on motors, 1 year on parts. Precision quality ball bearing Swiss built impeller motor heater. UL listed for safety. Maximum heating module temperatures at ambient room temperature. Integrated 30 watt fluorescent lighting kit producing approximately 150 watts of illumination with alabaster globe. Universal ball hanging system. Hangs like a ceiling fan. Specially die cast blade arms, weighed and matched to eliminate wobble. Electrical attachment blocks for speed and ease of installation. Remote transmitter to control heater, fan and light. Automatically senses and maintains desired room temperatures. 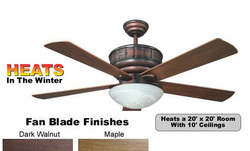 Reversible Aerodynamic 54-inch, 14 degree pitch fan blades. Balancing kit and installation tool kit. Anti-vibration gasket for hanging bracket. The Room Conditioner installs on normal household wiring (120 VAC 60 Hz), with a 15 amp circuit protection. A computer controlled remote saves you energy as the room heats up, the remote control tells the fan to shut down heating elements, saving you energy. If the room gets cooler, the remote will automatically tell the ceiling fan to turn on more heat. Heat is evenly dispersed throughout the entire room. No more cold spots!